Hot chocolate to draw me away from drinking green tea for a bit. 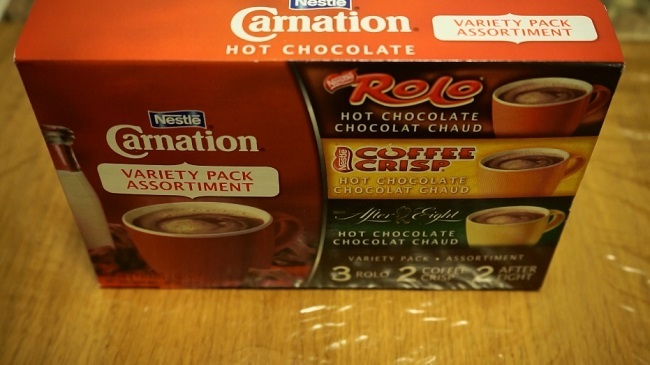 Seven packets of Carnation hot chocolate mix by Nestle. Included were three packets to make Rolo flavored hot chocolate, two packets for Coffee Crisp, and another two packets for After Eight. Within the packets were brown colored, fairly fine powders. All three hot chocolates were prepared using hot water only. No milk or any other additives such as sugar were added. The quantity of water was eyed instead of following the instructions and using a measuring cup -- partly due to laziness, mostly due to wanting to fill my cup to have more. For the most part, more water was added than recommended (I added about 400 ml), so taste was lighter than it should have been. I didn't hold this against the product. The After Eight version reminded me of After Eight chocolate right off the bat. There was a chocolate taste with the distinct mint filling flavor. That mint also left a pleasant after-taste in my mouth. As discussed in the preparation section, the quantity of water added was essentially to fill my cup, which meant adding more water than instructed. Despite doing so, I was pretty happy with the amount of flavor that came through. It did taste watered down, but not distractingly so to me. For the Rolo, I shouldn't have had those Hershey's chocolates while waiting for the hot chocolate to cool down. After letting my taste buds relax and other tastes to fade away, another sip was taken. This time, I was reminded of the Rolo chocolates fairly quickly. The flavor of the actual chocolate's caramel filling seemed to come through and it even left a bit of the aftertaste that I expected caramel to. I found the drink to be pleasant without any off-putting or overly strong flavors. Again, my drink was watered down, but I didn't notice even a hint of something unpleasant to me. The last one left was Coffee Crisp. I could taste some the chocolate bar, but it reminded me of the wafer part of a Coffee Crisp bar more than the rest. There was a coffee taste and the drink looked creamier than the other two -- no side by side comparison was done, so maybe it was in my head. Even though I watered it down, I noticed that this drink didn't seem as sweet as the other two -- some of the residue at the bottom was sampled at the end and I still thought the same thing. It's been a while since I had a Coffee Crisp bar, but I seem to recall a filling inside the wafer that when chewed produced a sweet taste. This was what I think I loved about it: a dry, sort of bland wafer, then a sweet filling. The second layer seemed light with this drink. Regardless, it was pretty good as a drink. I enjoyed the mix of flavors and the lighter hand on the sugar. 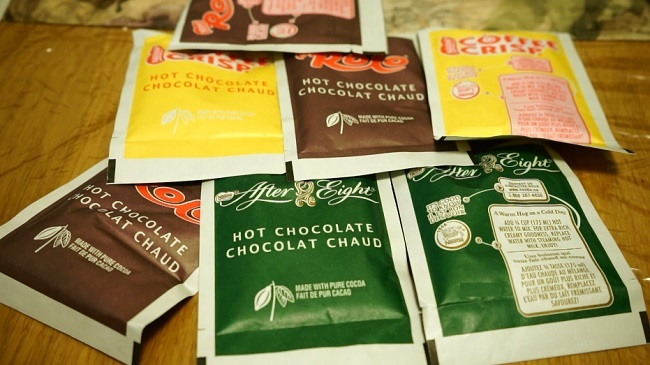 A good collection of hot chocolate packs in my view. The After Eight was my favorite, probably because of the mint. I didn't have any major complaints regarding the other two and would be happy to pick another pack of this stuff up.